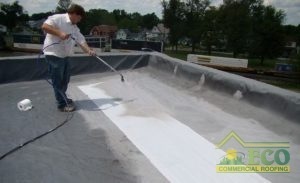 Our Affordable Roof Restorations Are a Great Addition To Your Commercial Roof! Is your commercial roof aging or displaying signs of wear and tear? An alternative to commercial roof replacement known as commercial roof restoration is a method used to fix issues associated with aging, and other basic damages. This includes damages such as cracks, broken seams, water ponding, punctures, and even leaks! With the addition of a roof restoration, you can enjoy a better roof, at a lower price. Be sure to keep in mind, however, that roof restoration is only viable for roofs with lighter damages, so it is important to act swiftly and have the roof restored before damages progress further. If you are hoping to save money and extend the lifespan of your commercial roof, you can depend on ECO Commercial Roofing, for affordable roof restoration in Texas, Louisiana, and Mississippi! Commercial roofs are a significant investment for any business, and they often require a significant amount of maintenance in order to stay in good condition. However, even the best maintenance adherence can’t stop the effects of aging. Eventually, you will be faced with a choice: commercial roof replacement or commercial roof restoration. Our affordable roof restoration techniques effectively coat the surface of your commercial roof with an incredibly tough and resilient material that extends the lifespan of your roof by up to 10 years. In fact, after those ten years, you can place an additional coating over the first one, and enjoy another 10 years of quality roofing. We achieve this with one of several roof coatings we stock here at ECO Commercial Roofing. The type of roof coating we use depends on your current roofing material, as well as your budget. Another great benefit to roof coatings is that they are far less expensive than a total roof replacement. When you opt for a commercial roof restoration, you don’t need to worry about expensive tear-away fees or haul-away fees for the resulting roof waste. Furthermore, because the original roof stays on top of your roof, it stays out of landfills, and allows your business to make less of an impact on the environment! All of our materials are high grade Conklin roofing products, so you know you’re investing in a quality application. If you’d like to learn more about the benefits of our affordable roof restorations in Texas, Louisiana, and Mississippi, give us a call today at (833) 200-0571! We are happy to answer any questions you may have as well as help you decide which roof coating will work best for your needs and budget.